The most natural way to learn is to imitate others. That’s why if you want to teach others what you’re an expert at, it’s wise to demonstrate your skills in action. Even a short video tutorial may be more effective than a big textbook. See how easy it is to make a training video using PowerPoint in this article that consists of two parts: tips on pre-production and a step-by-step guide. It may be tempting to skip the preparation part and move on to immediately working with the raw video files. However, adequate preparation is crucial for creating a professional video. These essential steps will help you make a tutorial that viewers will love. How well informed are the viewers? While newbies require additional introduction to the subject, veterans may find it boring or even insulting. How interested are the viewers? Will they search for the video themselves or will you share it with them? The level of interest and attention is usually inversely affected by the tutorial length. To engage viewers, you can shorten the video, break it into segments or add illustrative information slides with fast facts. It’s also a good idea to insert jokes here and there to retain the viewers’ interest. Last, but not least, what’s the age, gender and education level of the viewers? Define the demographics of your audience and choose the language of your video accordingly. You can learn more about defining a target audience and other advice in this list of 6 tips to create engaging training videos. When creating a training video, it’s crucial to prepare a narration script in advance. Having your speech written down will help you understand if any key points have been missed. It also allows you to avoid rambling and unnecessary pauses that would otherwise create a bad impression. In addition, you may want to create a storyboard for your training video. A storyboard is a series of thumbnails that demonstrates what the key scenes will look like. This technique is usually applied when the presenters, background or camera angle is changed from scene to scene. If you’re planning to combine a training video with a PowerPoint presentation, divide your script into parts so that each of them corresponds to a certain slide. In this case, it may be useful to create a presentation outline by opening the Outline View from the View tab on the PowerPoint ribbon. Alternatively, you can use the convenient narration editor that gives you the possibility to enter a script while seeing slide thumbnails and durations. Now that the scenario is ready, it’s time to move on to the scene. To make the tutorial more effective, film in a real-life environment directly relating to the topic of your training video. For example, if you’re teaching sales techniques, record your training video right at the sales desk. The best way to organize illumination is to set up the same lights at a 45-degree angle to the shooting area, which will help you avoid background shadows and keep the illumination even. Choose and adjust the light bulbs so that they don’t shine in the eyes of the presenter, yet the scene is bright enough. Make sure nothing will distract viewers from the main action: keep the backdrop minimal and meaningful. If you’re demonstrating a product, take advantage of the power of contrast; e.g., use lighter colors for dark items such as cameras. Besides backdrop, you will also need to adjust the presenter’s appearance. When choosing clothing for the presenter, keep in mind the target audience, especially their demographics and preferences. While creative how-to’s are more liberal in this matter, corporate training videos require a corresponding style. Poor quality tools may throw quality content out the window. For instance, it’s recommended to avoid using built-in microphones, as they may absorb too much background sound. Overall, there are two microphone types: condenser and dynamic. To find out which one to choose and why, read this guide to selecting the best microphone. It also contains instructions on setting the right recording level. It’s no less important to use an appropriate camera, since it will affect the resolution of your training video. Other factors to consider when choosing a camera are its mobility, zooming, viewing options and controls, such as focus. You can learn about the best cameras in this overview of the top 6 cameras for video lectures. If you’d like to capture your screen instead, check out these top 10 screen recorders on the market. This detailed comparison, with the tools’ pros and cons, will help you find the very software that will suit your needs. The final step before recording a video is the rehearsal. Read your script out loud and try to find the right pace and volume. You will understand how the written words differ from the spoken ones and perhaps change some text so that it sounds better. Run a few tests with a microphone at a different distance from the mouth to find the best solution. Reading a script often makes the speech sound monotone and robotic. It’s always a good idea to have someone listen to you practicing before recording. Ask others for some advice on how to make the narration more natural and clear. Once there’s nothing more to improve, go ahead and move on to the next step. Lights, camera, action! Now it’s time to implement all the preparation steps in practice. Here are a few tips on how to do it best. Don’t attempt to record the whole tutorial in one continuous shoot. You can record one video segment for one presentation slide at a time, or even break those into smaller parts. Thus you will measure once, cut twice: allow yourself (or other presenters) a breather and facilitate the post-production editing. Small video segments also address the problem of a short attention span: the shorter the video is, the easier it will be to retain the viewers’ interest. Viewers decide if a video is relevant during the first few seconds of playback. That’s why it’s better to start each video segment with the most desirable information or an outline of what will be covered. Provide viewers with more context and details, then wrap the video up with a brief summary and the key takeaways. You can also leverage the final few seconds to advertise the next video of the series. In the teaser, mention what the next episode will be about and when to expect it. This step is relatively easy, as training videos should be primarily informative, not fancy with special effects. You may simply remove the background noise and adjust the audio volume. If there are some parts of the video you wish to get rid of (e.g., if you’ve made a pronunciation mistake), you can do it using the video editor (see Step 8 in the guide below). If your tutorial is accompanied by a PowerPoint presentation, you can synchronize the video with the slides and the applied animations (see Step 9 in the guide below). This way, what’s being said in the narration will perfectly coincide with what’s being displayed on the slide. Keep in mind that reading the text will take a few extra seconds. To learn how this video presentation was created, read the following guide. 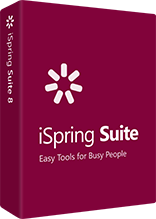 Download an iSpring Suite free trial (created content will be available even after the trial runs out). 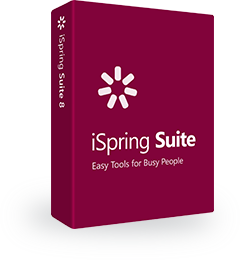 Open your PowerPoint presentation and switch to the iSpring Suite tab on the ribbon. Click on the Manage Narration button on the iSpring Suite toolbar. The Narration Editor allows you to overview all slides at a glance. Choose the one for which you would like to record a video from the Slide Thumbnails on the left and it will be scaled up in the center. The timeline below displays the duration of slides, audio and video (once you’ve added it). You can easily adjust the duration of slides by dragging their borders left or right. Use the Slide Notes on the right panel to insert your script. This way the narration will perfectly coincide with the information on the slides. When you’ve inserted a script, hit the Record Video button on the editor’s toolbar. In the open recording panel, mark Process current slide only to record video for the selected slide. The slide duration will automatically adjust to the video if the latter is longer. When you’re ready for filming, click on the Start Record button. To finish, click on Done. Reading the script from the screen will enable you to achieve “eye contact” with viewers. You don’t have to record a perfect narration at once, as you will then be able to polish it with the built-in audio and video editor (see Step 8). For example, if you make a pronunciation mistake, simply repeat the phrase and then delete the unnecessary fragment of the video. If you already have a training video that you simply wish to combine with your slides, you can import it by clicking on the Video button. In the Import Video dialog window, you can choose where to insert the video and mark Adjust slide duration. Now that you’ve added a training video, you can fine-tune it right in iSpring Suite using the integrated editor. Choose the video on the timeline, and click on the Edit Clip button. To delete a fragment of the video, click and drag the unnecessary part on the timeline, and press Del on your keyboard or the Delete button on the ribbon. To make the speech cleaner, for example, to avoid false starts, you can silence any part of the narration. To do that, select the desired segment and click on the Silence button. The trimming option helps you to get rid of long silent parts at the beginning and end of the narration. Select the part you wish to leave, and click on Trim. The Remove Noise and Adjust Volume options are made to perfect the audio quality. Finally, the Fade In and Fade Out effects enable smooth transition of audio from one part to another. They are often used with music at the beginning and end of the video. To preserve the applied changes, click on Save and Close in the upper left corner. If your presentation contains animation and transition effects, you can easily synchronize them with your training video. Select a slide on the timeline and hit the Sync button. A Sync panel will appear above the timeline. To start the process, click on Start Sync. The Start Sync button will be replaced with the Next Slide/Next Animation/Skip Transition buttons, depending on the upcoming element in your presentation. Click on them at the appropriate moments, for example, when you want the next animation to be inserted. When you have finished, click on Done and then Save & Close in the upper-left corner to close the narration editor. The last step is to publish the resulting video lecture in Web format to make it accessible on any device. On the iSpring Suite ribbon, click on the Publish button, then choose the Video Lecture Player as demonstrated in the picture. This player displays slides and video in a 50/50 proportion that can be changed at any time during playback. Alternatively, you can choose the Universal player and click on Customize to configure its layout. Next, define the Presentation title and a Local folder where your video lecture will be saved. Under Output Options, select Combined (HTML5 + Flash) so that the file can be viewed on both desktop and mobile devices, then click on Publish. To share your video lecture, you can use iSpring Cloud hosting platform, which generates short links and embed codes for the uploaded content. Another way to deliver material is to use iSpring Learn LMS, which has a number of advanced managing and tracking options. To publish your materials to iSpring Cloud or iSpring Learn LMS, use the corresponding tabs on the left-hand side in the Publish Presentation window. The art of making a perfect training video or video lecture implies many different aspects, including the right choice of recording devices and backdrop, and many others. Hope this overview will help you create a high quality tutorial that your viewers will love.